It’s nearly dark when we reach the entrance of the Kerala Kathakali centre near Santa Cruz Basilica. I buy banana chips fried in coconut oil from an old woman sitting by the door, and we file in to find our seats. On the small stage, three men in sarongs are carefully applying thick makeup with the aid of tiny wooden mirrors. A man in white is lighting oil lamps around the edge of the stage. 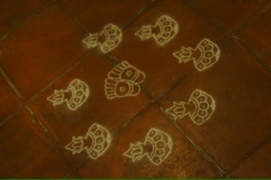 He carefully stamps intricate designs along the aisle with white powder. We tourists pull our cameras out, try to reach our seats without dislodging the designs. There is an audible groan from the (mostly foreign) crowd when one man stomps right through them, oblivious. 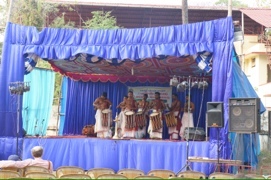 The man in white takes the stage, and two men line up stage right, strapping drums around their waists and beginning a gentle rhythm. The man in white begins to chant, then breaks into halting English to welcome us, and to introduce the evening’s performance. 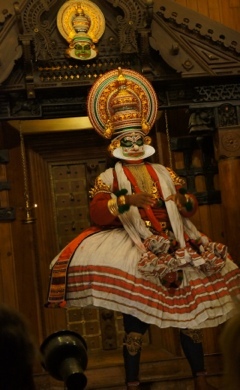 Kathakali is a highly stylised form of dance that dates back to around the 17th century. While there is occasionally movement that is recognisable as dancing, the real art lies in the finely nuanced expressions of the performers, and the series of hand movements known as mudras. 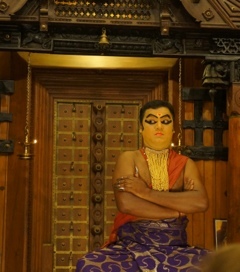 Before the performance starts, an actor is summoned to demonstrate first the eye movements, and then the mudras. His eyes are bloodshot red, an effect achieved by putting a particular kind of seed into his eyes for several minutes. My eyes squint shut in sympathy. One of the girls in our group is a dancer, and has taken lessons in classical Indian dance while she is here in India. She reports spending the entire first lesson practising moving her eyes in a complete circle, from right to left and then back again. After an hour she had yet to meet her teacher’s demanding standards – but then, it can take 10 years to master this form of dance, so I imagine it must take at least a year of that to perfect a good eye-roll! After the eyes come the hand gestures. Some of these prove to be less subtle than I had anticipated – there are multiple ways of saying “come here”, from a suggestive raise of the eyebrows to an emphatic pointing gesture accompanied by a stamping foot! The gestures become increasingly elaborate. My favourite (and one which two members of our group have developed into a superb and slightly risqué party piece) is said to represent the bee landing on a lotus flower. At last it is time for the performance proper. 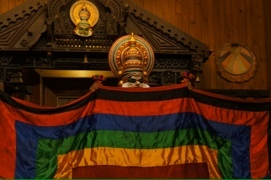 Two uninterested-looking pot-bellied men in sarongs enter, and turn out to be the official curtain raisers – they hoist a rainbow coloured quilt between them, and for the first ten minute or so all of the action appears to be happening behind it. The man in white turns out to be the singer, alternately chanting, singing, and providing short explanations in English. As seems to be the way in South India (and maybe the North too, for all I know), the gods are ever-present and each performer conducts a small ritual when entering the stage, before bowing to each of the singer and the musicians. 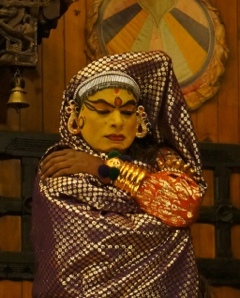 The story is an excerpt from a longer play – in the days when villagers would travel huge distances for religious festivals, the performances would last all night, and would be attended in lieu of finding accommodation. While that must be quite a spectacle on the rare occasions that a full play is performed, I’m a little relieved that we are only being treated to an excerpt. It’s fascinating, but the more subtle details are lost on me, though the ritual-like aspects remind me of Japanese kabuki on a smaller scale. I can tell you that the plot revolved around the anti-hero (indicated by a bright green face marked with red, and an elaborate skirted costume) attempting to abduct a beautiful lady (played to hammy effect by a man with bright yellow makeup, in stark contrast to his dark brown hands), who escapes and returns to her husband with the ruse that she will meet the bad guy later. The husband hatches a plot for revenge, lying in wait under his wife’s robe. When the evil-doer appears and tries it on, the husband leaps up and slays him. There is no sign of a lotus, let alone a bee flying anywhere near it, but this in no way reduces the campness of the evening. The performance lasts an hour and a half, plus makeup time. The cost was approximately 250INR. 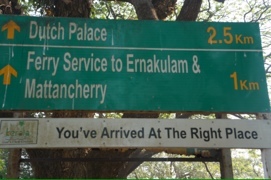 It’s a glimpse at a unique part of South Indian culture which, while it might not be everyone’s cup of tea, is certainly worth seeing at least once. I know the plane is getting close to Kochi when I see the spiny ridges of the Western Ghats cutting through the clouds. On landing I’m thrilled to find my taxi is an old Ambassador. These cumbersome white cars are the vehicle of choice for the Indian public service (who often add a flashing red light to the roof for extra importance). They were based on the old Morris Oxford, and the engine capacity has improved over the years but, unlike the VW Beetle and the Mini, from the outside there are no discernible design improvements – the only way to tell a new Ambassador from its vintage counterpart seems to be by the amount of rust. I share the taxi with a young Israeli-American girl that I met during the long wait at Bangalore airport. She’s here for a month-long yoga teaching retreat, and is staying in the city part of Kochi, Ernakulam. After fighting our way through the traffic to her hotel, past billboards advertising condos and silk emporiums and restaurants selling 36 different kinds of dosa, I’m hoping that Fort Kochi will be a little quieter. 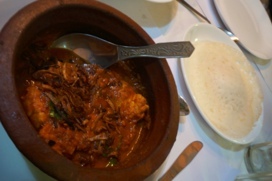 Kochi (formerly Cochin) was (like Goa) colonised by the Portuguese after they discovered its rich array of spices. The Dutch took over from the Portuguese, and in turn were ousted by the British. 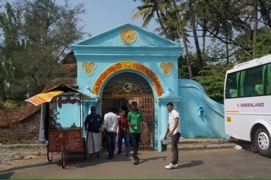 Like Goa, there is a strong Christian community of the particularly Indian variety – roadside shrines draped in fairy lights are as likely to contain statues of the Virgin Mary or St Sebastien as they are Ganesh or Shiva. I pass a vast construction site which, judging from its shape, must surely be a new cathedral. 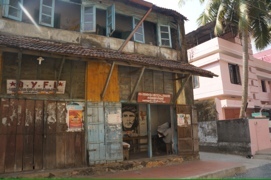 Fort Kochi is a sleepy peninsula that, I’m relieved to find, feels a world away from the city. I’m staying in a little guesthouse with just three rooms, down a tiny alley that the Ambassador can barely squeeze into. 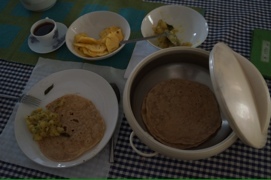 It’s run by a lovely couple who live on the ground floor with their family, and come upstairs every morning to cook breakfast, then sit and chat while I eat – the ubiquitous dosa, or maybe a chapatti, with potatoes yellow with turmeric and studded with black mustard seeds and curry leaves. On my first evening, my host insists on escorting me to the local restaurants so that I will know how to find my way back in the dark. Halfway there, the streetlights suddenly go black, and the power stays out for about twenty minutes. I have chosen to eat at Oceanus, a seafood restaurant near the Bishop’s Palace, with a promising young chef who has recently branched out to start his first solo venture. There is a huge window separating the tables from the kitchen, where five or six young men are busy chopping chillies and mixing spices by the light of the gas burners. Just as I am beginning my Kingfish curry the lights come back on, and I am a little startled to find myself sitting next to an installation comprising a paddling pool full of water, about a metre square, which is draped with fishing nets and fairy lights, and in the middle of which sits a big plaster statue of the Virgin Mary lit in red. 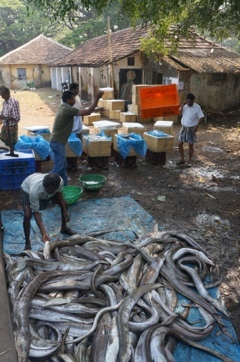 The next morning I set out to explore Fort Kochi by day. It’s a little fishing village-turned tourist haunt, with dusty, sandy roads on which the only traffic seems to be a few autorickshaws searching for customers (I’m a prime target), and the occasional bus. 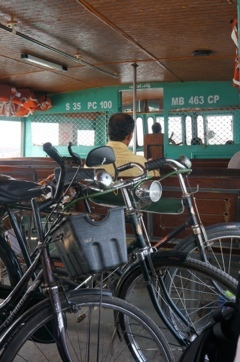 It takes about 30 minutes to amble from one side to the other, frequent stops for fresh lime soda excluded. I wander towards St Francis church and leave my shoes at the door. Inside, the cool stone floor is scattered with headstones and memorials dating back to the 1600s. To one side, an unremarkable stone is surrounded by tourists – this is the original burial place of the great Portuguese explorer Vasco da Gama, until his remains were exhumed and taken back to Lisbon. Above the wooden pews, heavy material hangs from wooden battens, secured by ropes to the wall. A man walks past and asks if I know what they are, then makes a fanning gesture and says “punkahs” – they are huge fans, the ropes pulled by punkahwallahs to keep the congregation from fainting in the heat. Another block and I reach the ocean. The path along the sea wall is littered with shells, fishbones and, well, litter. 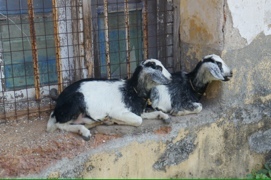 Goats wander here and there, and humpbacked cattle amble along, stopping to nose at piles of rubbish. Ungainly wooden structures rear out of the sea all along the shoreline, draped with blue net and rope. The Chinese fishing nets exist now as tourist attractions rather than viable enterprises on their own account, with fish stocks diminishing and more effective fishing boats taking most of the catch. 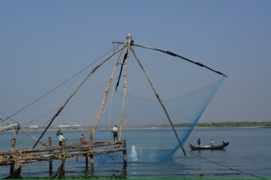 The ten or so nets in Fort Kochi are still in working order though, and the fishermen call me over to take a closer look. 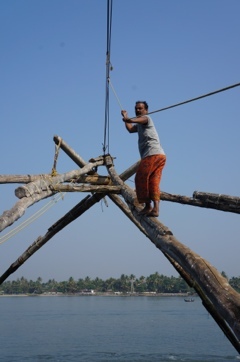 I tightrope-walk along the plank leading out over the sea, and they haul on ropes to bring the huge net out of the water. Glistening at the bottom are a handful of silvery fish that would be illegal catch at home, but they are tipped into a smaller net and added to the stockpile for the market. 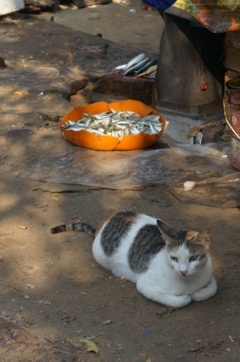 Further along the wall is the fish market, and stalls that will cook your chosen fish for you on the spot. I continue wandering along the road, past the ferry terminal (Kochi is a series of islands and peninsulas, and the most efficient way to travel is often by boat), until the sun’s heat finally defeats me and I duck into Cafe Solar, a cavernous old Portuguese warehouse that has become an organic restaurant and performance venue. Coffee comes thick and dark in a delicate porcelain pot, and watermelon juice is garnished with a slice of melon that is nearly as big as the glass. It’s the kind of place where you could spend a whole afternoon, reading, writing and watching the world go by. So that’s exactly what I do. Later that night, I meet up with Mayaan, the Israeli girl, for dinner at the famous Dal Roti, where the clientele is exclusively foreign but the food is authentically South Indian and delicious. The veg thali is especially good. 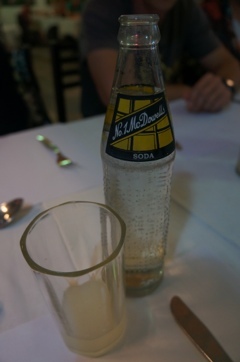 After dinner we wander past fancy hotel gardens where guests sit silently listening to sitar music, and the noisy XL bar with cafeteria tables full of backpackers, before climbing the stairs to a cafe on the corner of Princess Street which serves juices and lassi. I don’t think I will ever get tired of fresh watermelon juice – why have I never seen it on the menu in London? Princess Street is a tourist hub, lined with tiny shops selling sarongs, postcards, bronze statuettes and memory cards. There are a few Internet cafes, and a couple of good English language bookshops (Kochi books, upstairs above a grocery store, fast becomes a favourite). I’m struggling to resist the urge to pick up a couple of cookbooks – maybe at the end of the trip? Besides, I tell myself, I already have far too much stuff. I spend the last morning at the guesthouse sorting through my pack and culling as much as I can, then ask my host for directions to the post office. When I ask if I can buy packaging material, he adds directions to the local tailor. Sure enough, just around the corner from the post office, a tiny shopwindow bears the sign “packages made”. Inside a smiling woman gestures for me to sit, and bundles my belongings into a small cardboard box that has definitely seen better days. I’m a little dubious, but she pulls out a tape measure and disappears, returning a few minutes later with a muslin bag that she has made to measure. 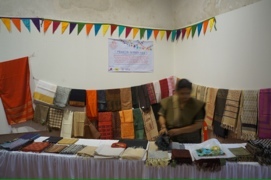 The box is carefully squeezed into the muslin, which is folded and sewn shut by hand. She lights a candle and carefully melts sealing wax over the thread.